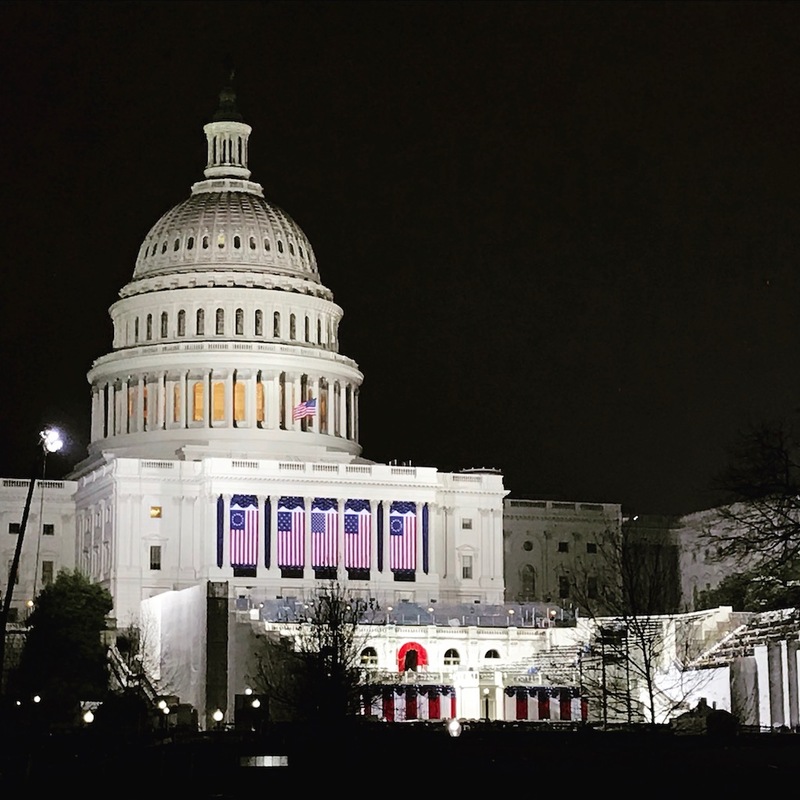 This is the second of a five-part series on my experiences and observations of the 58th Inauguration for President of the United States. The other posts will be: From a sea of Red to oceans of Pink | Good intent gone very wrong | Escape from D.C.
After a long day of walking and watching an celebrating with hundreds of thousands the evening became very quiet in downtown Washington D.C. Due to the fact that the inauguration parade had just ended hours prior, all of downtown D.C was barren of just about any vehicles. Constitution avenue was still barricaded off which kind of gave all of down a eerie post-apocalyptic feel to it. It was quiet, largely motionless and even had a low haze or fog that kind of hung over all of the monuments. If you have ever been to Washington D.C., then you know it is always busy with cars, people and sirens (at least it seems that way), so on this one night that only comes once every 4 years it was very special to be able to walk downtown. I didn’t realize it at the time until I reflected later just how special this was to have all the business going on. There were only flatbed 18 wheelers traveling up and down Constitution Avenue. They were there to pick up all the fencing, port-o-johns, and other materials. The trucks were escorted by DC police so they could only move when they were allowed to and could not just drive on their own. it was great to walk from one of Constitution Avenue west of the White House, all the way down to the Capital almost unimpeded. As we got closer to the Capital we did run into more construction workers who were very busy and paid us barely any attention. They were tearing down fencing, locking up the port-o-johns, re-installing stop lights in the middle of the road, etc. At the end of our journey, we found ourselves staring at a great sight that just hours earlier was the most watched plane in the world. Actually before this whole walk started we had just left the hotel and found ourself on a blocked off street west of the Whitehouse. There were a handful of people walking on the sidewalks, but it became clear something was about to happen as the local police told us to stay on the sidewalks. Since there were no cars allowed on the street, this order got my attention. Why would you care about us staying on the sidewalks if there are no cars, unless there were about to be. Needless to say that is what happened. 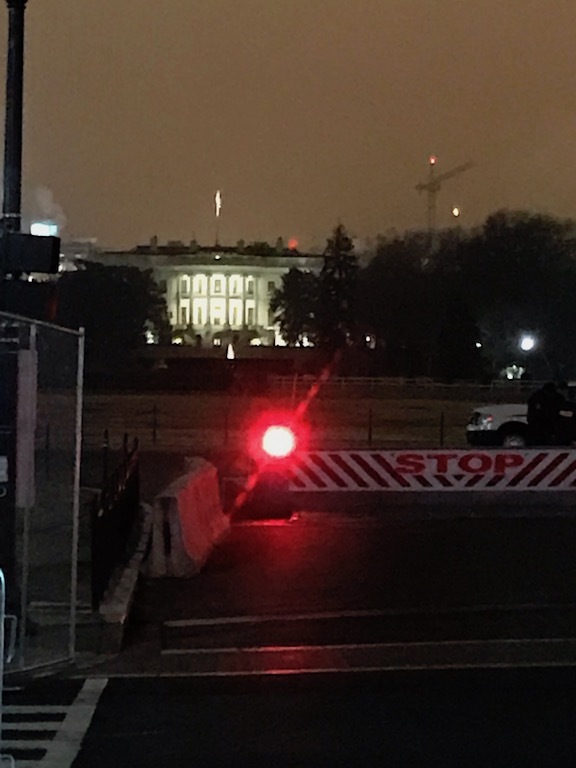 There weren’t any cars at the time but within minutes the street filled with flashing lights and black cars as the President and First Lady and The Vice-President and his wife left the White House to start attending the Inauguration balls for the evening. 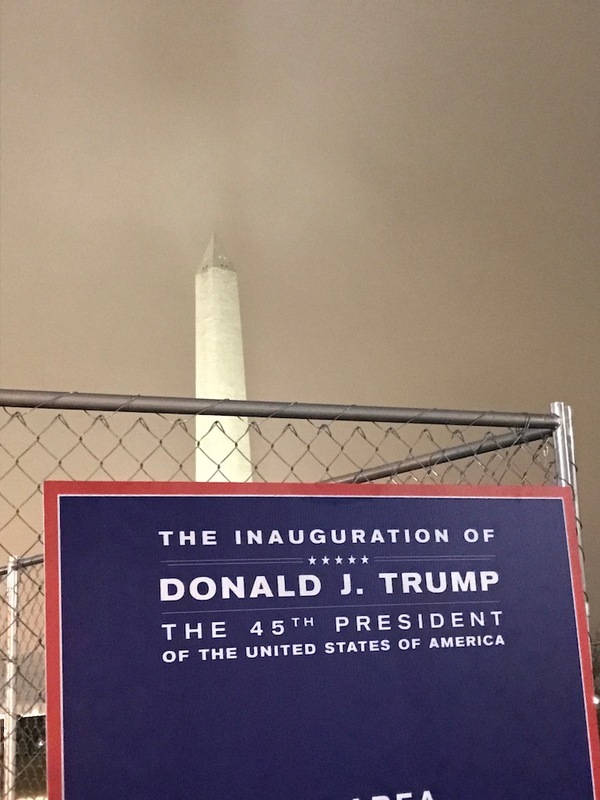 It was pretty cool and very special to be one of a handful of people lucky enough to see this as they left the White House grounds and made their way through D.C. streets.